If beautiful gardens & spectacular landscapes form part of your travel wish list criteria, experience the superb variety of foliage & flowers that Europe has to offer. For years go-today has customized garden-inspired itineraries in Europe for gardening clubs, botany & horticulture students and family & friend groups interested in cultivating their green thumbs abroad. Europe has an abundance of beautiful gardens complete with Victorian glasshouses, superb landscaping and in many cases - hundreds of years of history. Consider touring Kew Gardens, the Royal Botanic Gardens in London, which comprise some 300 acres. Elsewhere in England your group may choose to visit Sissinghurst Castle's Gardens, the Royal Horticultural Society's Garden Wisely in Surrey or the Exbury Gardens, world-renowned for its Rothschild Collection of camellias, rhododendrons, azaleas and rare trees. In Cornwall the lovely Trelissick Gardens host open-air theatre during the summer period. Touring the many manor houses and charming cottages in the Cotswolds, such as the Snowshill Manor & Garden, could prove to be another fabulous experience. If your group is considering visiting England in May, we can arrange entrance to the Chelsea Flower Show, the largest flower show in the world. Go-today also works with private estates, national heritage associations and palaces throughout continental Europe and collaborates with local guides who share a passion for horticulture. 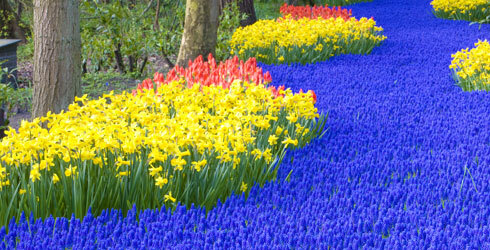 Visit historic Keukenhof Park in Holland, famous for its tulips, hyacinths & daffodils. Tour the breathtaking gardens in Giverny, France, which inspire our groups as they did the Impressionist painter Claude Monet in the late 19th century. Also on the outskirts of Paris your group can tour the park & rose garden of the medieval Chaalis Abbey, explore the renowned DÃ©sert de Retz or visit the spectacular Versailles Palace, on whose grounds Marie Antoinette herself dabbled in horticulture, redesigning the gardens of Petit Trianon to adopt a more English style. If your group wants to explore the French Riviera, we can arrange for a tour of the majestic Villa Ephrussi de Rothschild and its nine magnificent gardens. If Rome is on your itinerary, we can send your group to an UNESCO World Heritage Site, the Villa d'Este, for a guided tour of its Italian Renaissance garden. If a visit to The Alhambra in Andalusia, Spain is on your agenda, a visit to the Arabic-inspired gardens at the Generalife will awe your group. Whether your group intends to dedicate the majority of its time to visiting exquisite gardens or it prefers to combine the visits with other activities such as afternoon teas, theatre performances, general sightseeing, market tours, cooking classes or wine tastings, with offices in both the United States and Europe, we have the resources, knowledge and expertise to design the perfect gardening tour to fit your group's needs, curriculum and interests. We offer the following services to make your group's experiences abroad convenient, affordable, memorable - and green. Enjoy nature's bounty as you visit castles, manor houses and stately halls graced with exquisite gardens, including rock, woodland and herb gardens. Marvel at the national bonsai collection at Malleny House. Visit the cottages where two beloved English writers, Beatrix Potter and Williams Wordsworth lived as well as a museum honoring the prolific Bronte sisters. View the complete day to day English Gardens Itinerary. Gardeners, historians and architecture buffs will all enjoy this trip to Japan. The great gardens of Japan delight nature lovers with their tranquil atmosphere, fruit and maple trees, flowers and more. There are also parks and gardens on the grounds of several of the temples and shrines visited on this tour. Everyone will be fascinated learning about the lives of the mighty emperors and shoguns who ruled the country for centuries and the more sobering facts of Hiroshima. View the complete day to day Gardens of Japan Tour Itinerary.